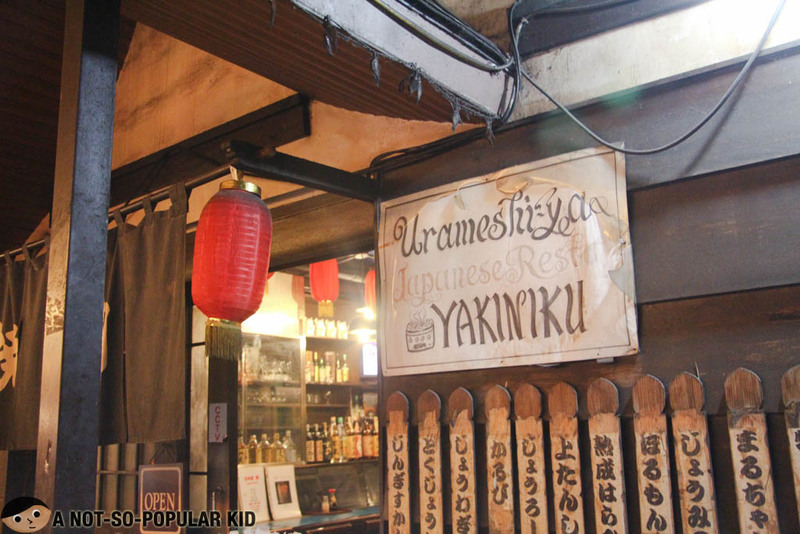 If you feel like you foodie life is dulling out these days, you may want to energize it by checking out this place called Urameshi-Ya. Not only will you get to be immersed in Little Tokyo's fancy and cultural ambiance; you will also get to indulge yourself with an Unlimited Wagyu Beef Cubes in the restaurant as well. We came to know about this place and its promo via a friend and her prince's recommendation. They said that they really enjoyed the experience, and they wanted us to share that enjoyment with them. Hence, when they decided to dine in the place again, they invited us to join them. 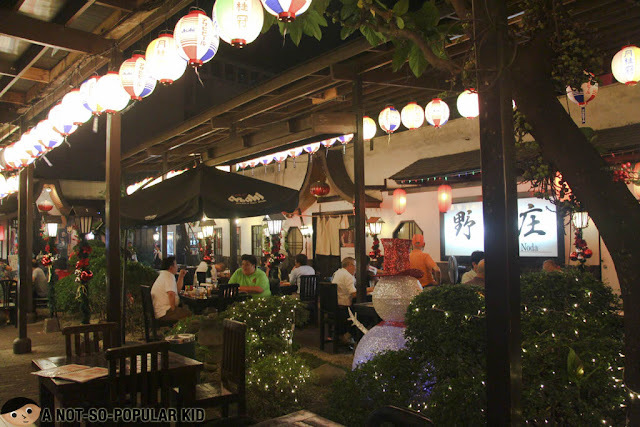 Uramaeshi-Ya is located in this place dubbed as Makati's Little Tokyo. 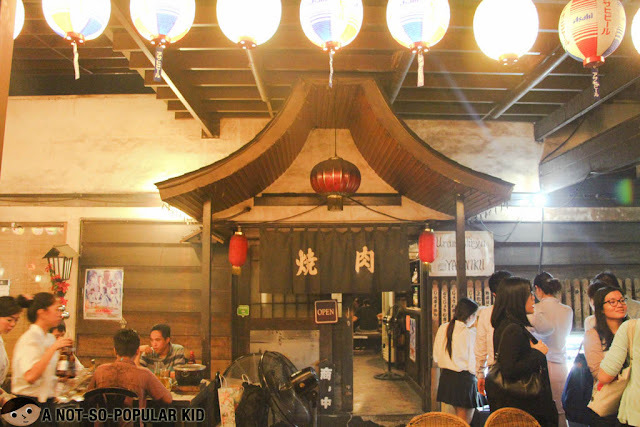 It's a place that somehow resembles some parts of Japan where you can find several food spots. There are a handful of restaurants you may pick here in Little Tokyo, and I was able to previously blog about one of them here. 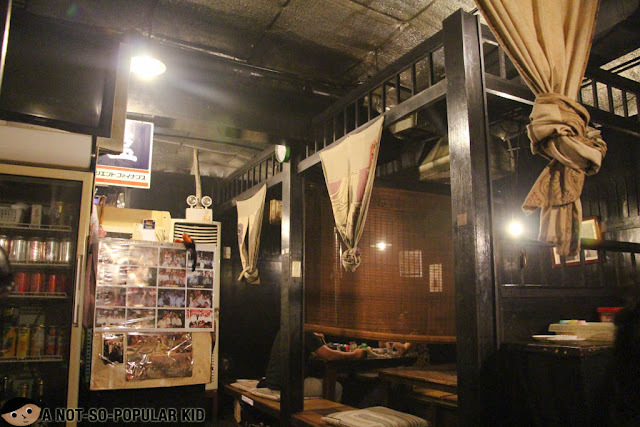 However, right now, we will just talk about this restaurant where you can find some unlimited yakiniku (or grilled meat), and that is Urameshi-Ya. Urameshi-Ya is really starting to gain popularity with its current unlimited yakiniku promotion. Hence, I highly advise that you go here as early as 7:00 PM to ensure seats. We were fortunate that by the time we got there, we were immediately accommodated. Just like the other restaurants here in Little Tokyo, the interior of Urameshi-Ya featured a somehow dreary vibe with the "authentic old-fashioned feel" as the dim lighting shrouded the place in both an air of mystery and authenticity. While comfort could have been sacrificed, the interior surely makes it feel legit -- adding to the great immersion and experience. The Unlimited Wagyu Beef Cubes and More, according to our DJ friend Brandon Jon and Elaine, is available from Mondays to Thursday at P500 nett. 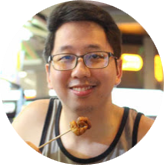 Do take note that you are only given 45-minutes to ask for additional dishes from the moment you choose your first set of dishes to grill. Of course, you can stay beyond 45 minutes there in the restaurant to finish all that you ordered for. Restaurant has a strict no leftovers policy. Promo Duration: I am unsure about the duration of this promo, so I urge you to try this as soon as you still can. I'll update this as soon as I get an info about it. You may find here about 6-10 varieties of dishes to grill, depending on their stock availability, but we chose to have the oysters, the prawns, the crab and of course the famous Wagyu beef cubes. 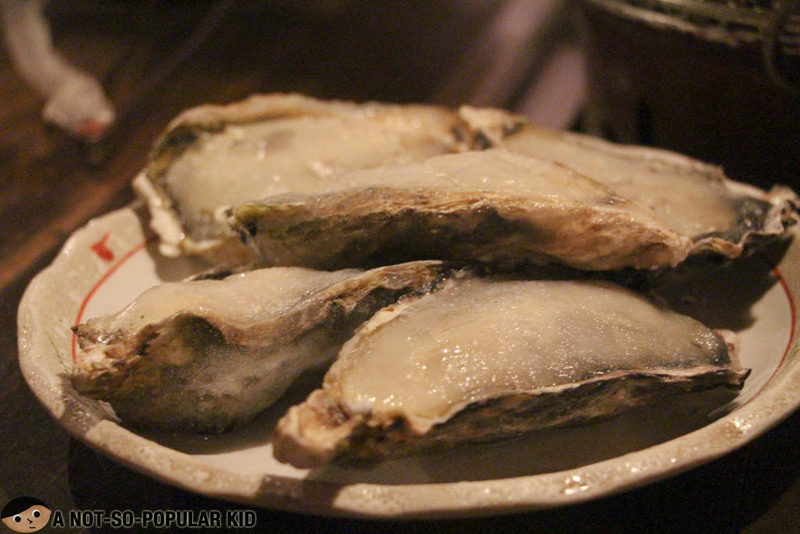 The oysters were huge, and the taste really captured the essence of the sea. It was heavenly. However, do not have too much of it, and never eat it with an empty stomach. I don't want you to suffer the following day. 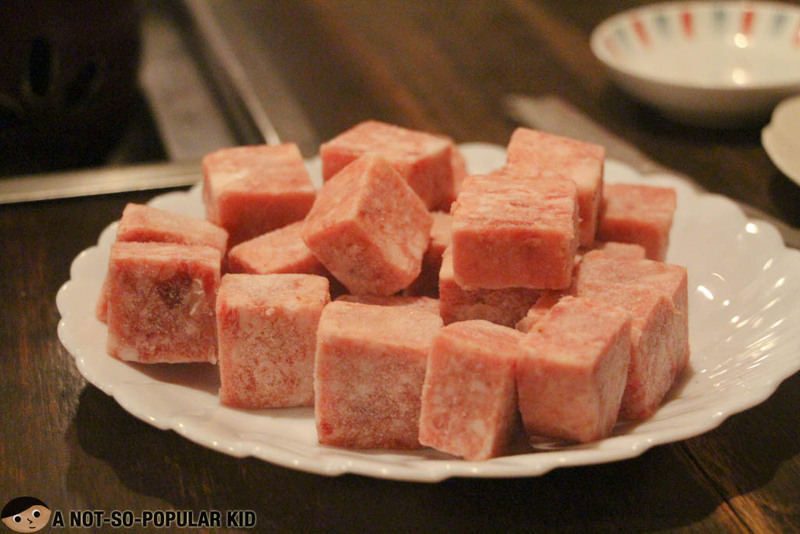 The Wagyu beef cubes had the right flavors in it and it was also tender due to the good amount of fat. We hailed this dish as the highlight of the night, and to prove how much we loved it, we had more than 10 plates of it. We were THAT hungry for Wagyu! 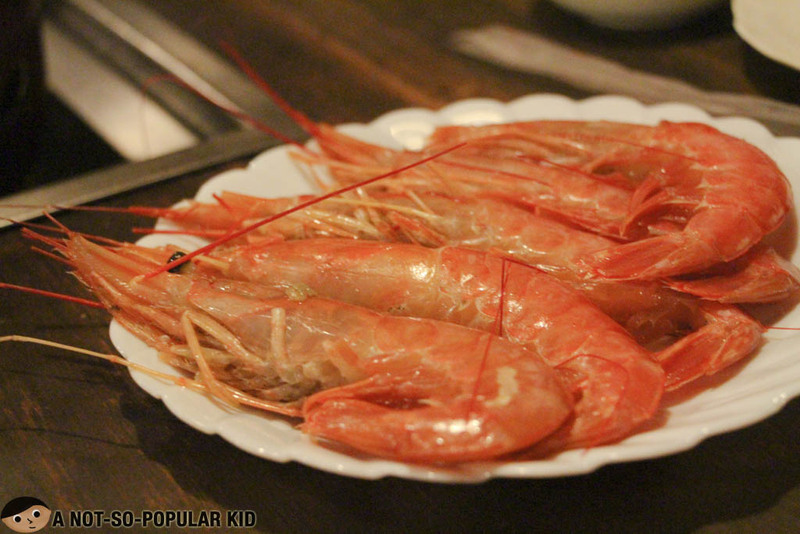 The prawns were sufficiently fresh and huge. Making each bite heavenly. It was just amazing! 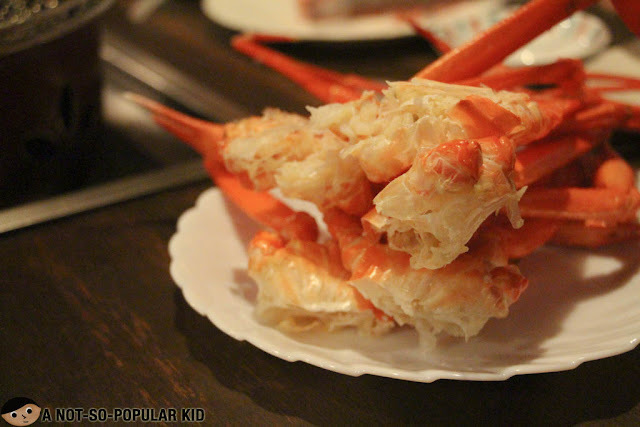 I wasn't able to taste the crab because it was difficult to cook and eat. 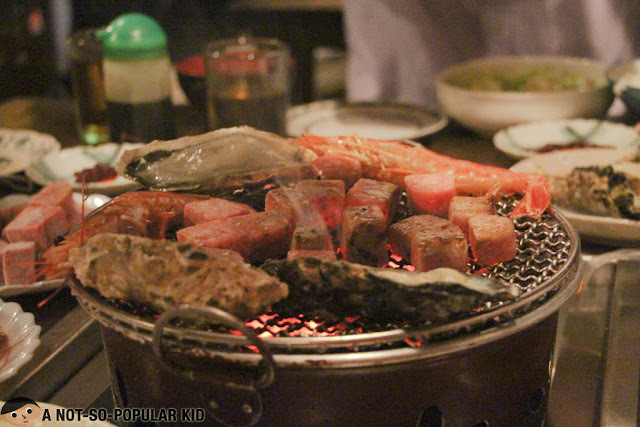 Anyway, the grilling pot is only medium-sized, so you can only cook limited number of food at a time. 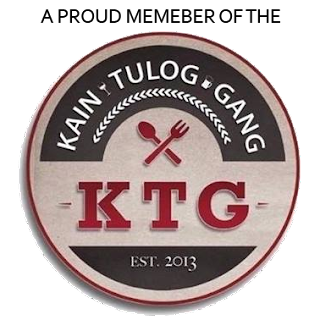 As mentioned, it was truly a great dinner experience -- from the ambiance, to the actual grilling and eventually eating, and I am giving this place two thumbs up! 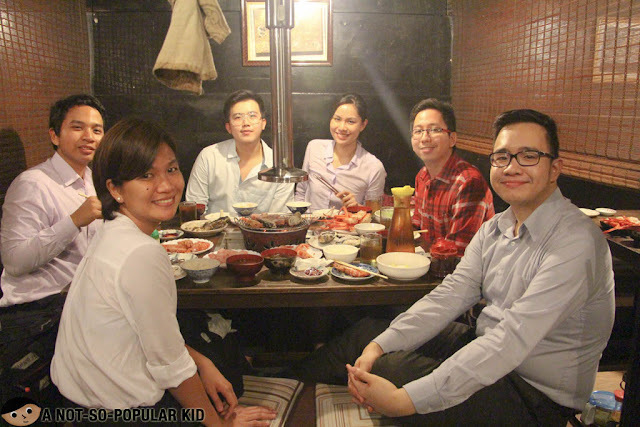 I'm sharing this photo of us to show how much all of us enjoyed this Wagyu night. Happy tummy! By the way, all thanks to our dear friend Elaine for the delicious fun-filled night! 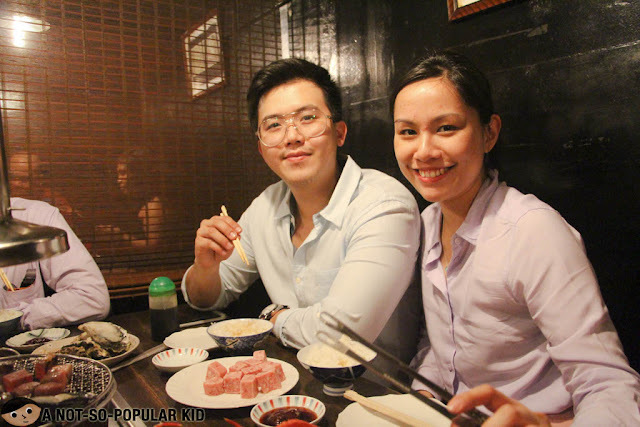 Budget: P500 each for the eat-all-you can yakiniku -- unlimited wagyu beef cubes and more! 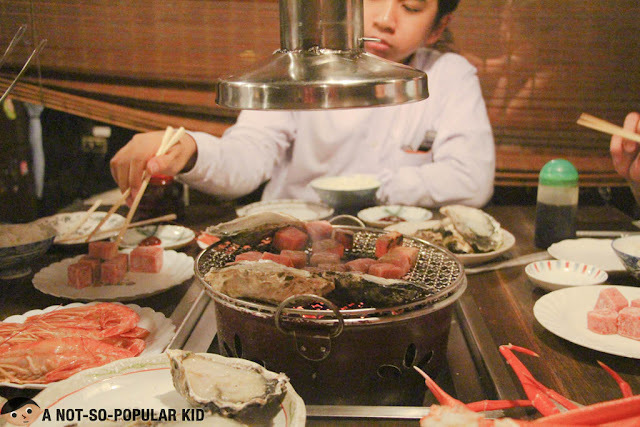 The Unlimited Yakiniku is available from Mondays to Thursday ONLY at P500 nett. 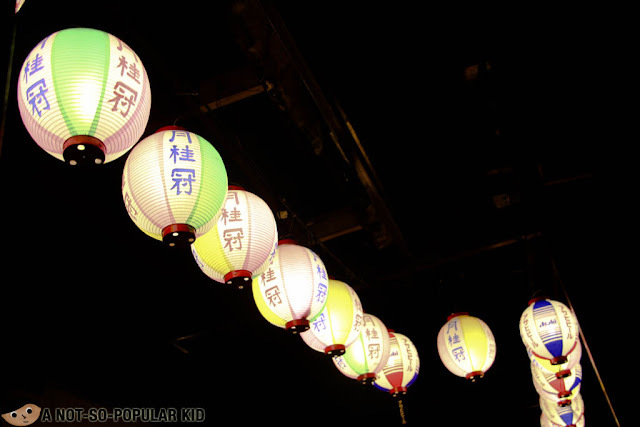 Our experience here in Urameshi-Ya is surely an unforgettable one. It was a night full of great grilling memories. The dishes we had were all amazing, and sufficiently fresh. Also, there is little to no delays when you ask for refills making the price all worth it. In fact, if I come to think of it, you may even get something more than the price depending on your experience. Maybe the waitstaff need to smile more often in order to boost the vibrance of the place. Lastly, do not forget to have the Wagyu beef cubes; they are GOLD!